Ok, I entirely failed to post at all last week. I had pictures, had thoughts, had no time. Still a little short on time this week too, then again, when am I not these days? Amber has been diligently working on her election unit study and it is actually going well, despite a lot of broken links in the study guide. This definitely isn't the best unit study we have done, however Amber is enjoying the experience. She especially likes all the video links with movie excerpts, cute songs, and cartoons. Overall, this has been a positive experience while a little frustrating with so many broken links. Amber and Biscotti, posing for a new phone cover picture. Biscotti helping with an election study project. He was terribly interested in the paper cutting and iPad. Biscotti in his "King of the Classroom" pose. He often sits on the edge of Amber's desk, surveying the surrounding room. Math has been something of a challenge this year. Academically, Amber is handling skipping a year of math just fine. She is not having any problems with the content, whatsoever. Unfortunately, her attitude needs an adjustment regularly. Amber is good at math, very good. She enjoys it too, except when she sees it as an obstacle in her way to an early morning break. Those days the problems aren't copied correctly, problems are skipped, problems half finished, and generally unreadable. This results in many incorrect answers. Then we have the anger over so many wrong answers and the requirement to correct them all. She ends up having a late, and short, morning break. Someday she will realize it doesn't pay off to rush math assignments. 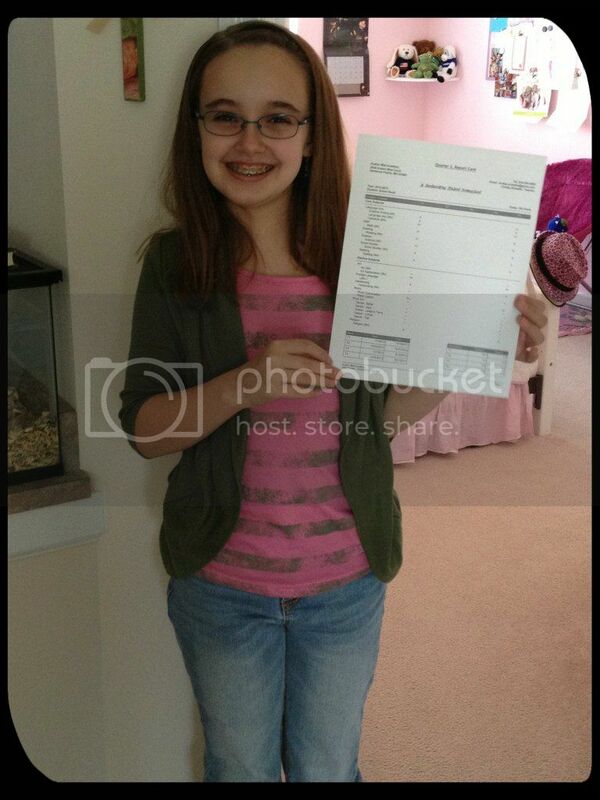 Amber with her 1st quarter report card. Straight A's, again. She squeaked by with an A in math. Time to buckle down. Science this year is also lacking somehow. Looking over the curriculum it seemed fine, plenty of experiments, enough discussion items, not too much gobbly gook to get in the way. Unfortunately, when we get down to doing the experiments many turn out "lame". Not a word you want to hear in connection with science. Some of the experiments also have fairly obvious outcomes. This is obvious to a 5th grader, not to only an adult. We've started skipped the "lame" and obvious experiments, which doesn't leave us with a whole lot to use. I'm evaluating the experiments later in the curriculum to see what we might be able to salvage and what I'm going to need to supplement because the current pattern of read the text and complete the worksheet with a random experiment is not endearing science to Amber in the least. One thing is certain, we will not use BJU science next year for life science. Amber already dislikes life science, no need bore her to tears with it too. Science Lab - learning the difficulties involved in an oil spill clean up. 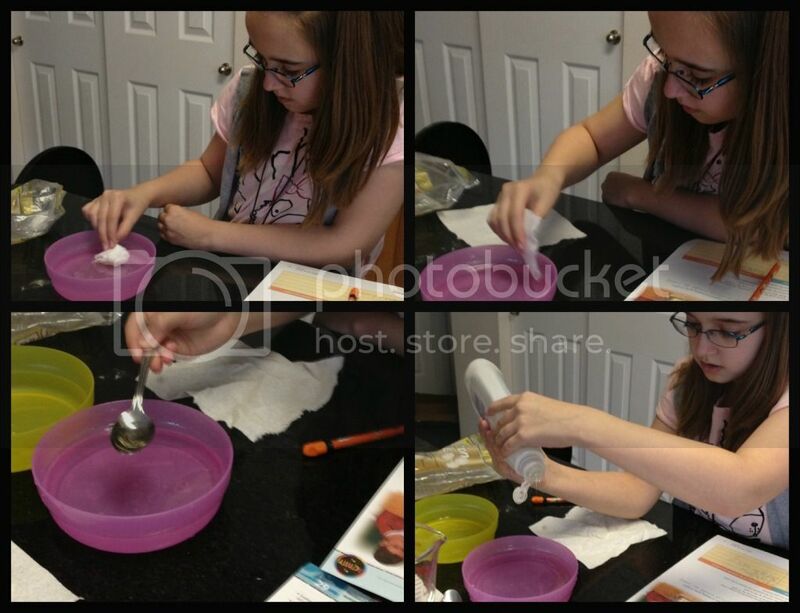 She used 4 methods that are simplified versions of real-life methods. Ivory dish soap to "chemically" clean the water, was the most effective method, but left soap behind in the water. In addition to focusing heavily on dance, Amber has been more dedicated to her various music studies these past two weeks. She is truly enjoying her voice lessons and is giddy about participating in the Christmas musical recital. She always enjoys her chimes choir practice, but she has worked up to having 4 notes (but 2 hands) that she must switch between. Last year, the most she had was 3 and that was rare. 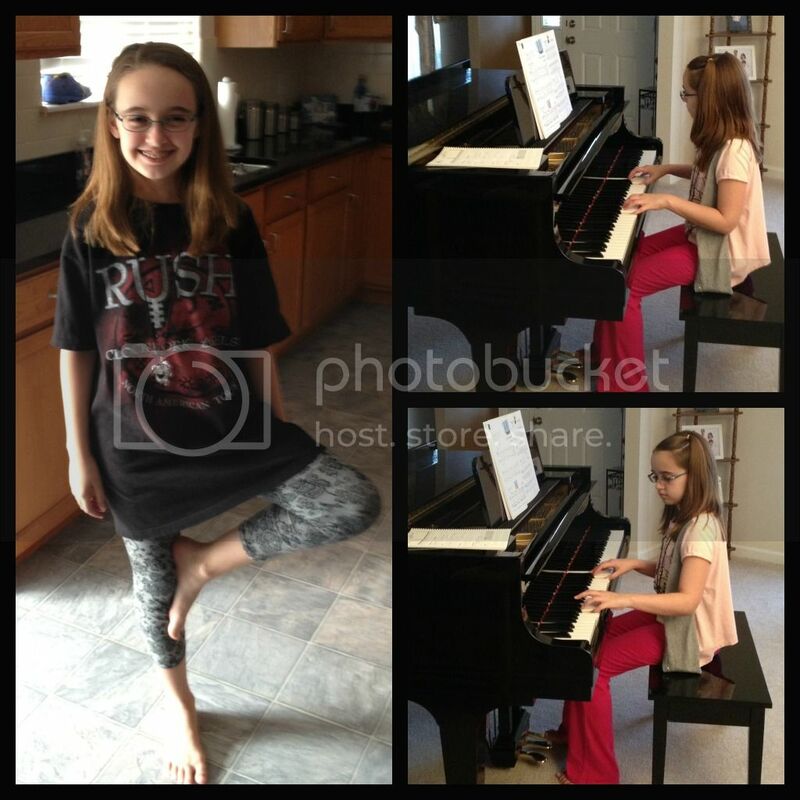 The biggest change that I have seen though is at home with her piano practice and lessons. It was almost to the point that I was going to stop her lessons, but as suddenly as she became disenchanted with piano she returned to loving it. Amber practices daily, except for the l-o-n-g dance day, and even practices more than the required time. I don't have to force her to sit for lessons either. This has been a most pleasant and welcome change. Dance, dance. She even stands around in dance poses. Practicing piano, without being tied to the bench for the required half hour!!! We have spent several days with my mom in the past couple of weeks too. I STILL haven't sealed Mom's deck and it's getting almost too late this year. The weather and our schedules never cooperate. One afternoon we did go in with the intention of me sealing the deck while Mom and Amber worked on a craft project, but it surprised us and rained. 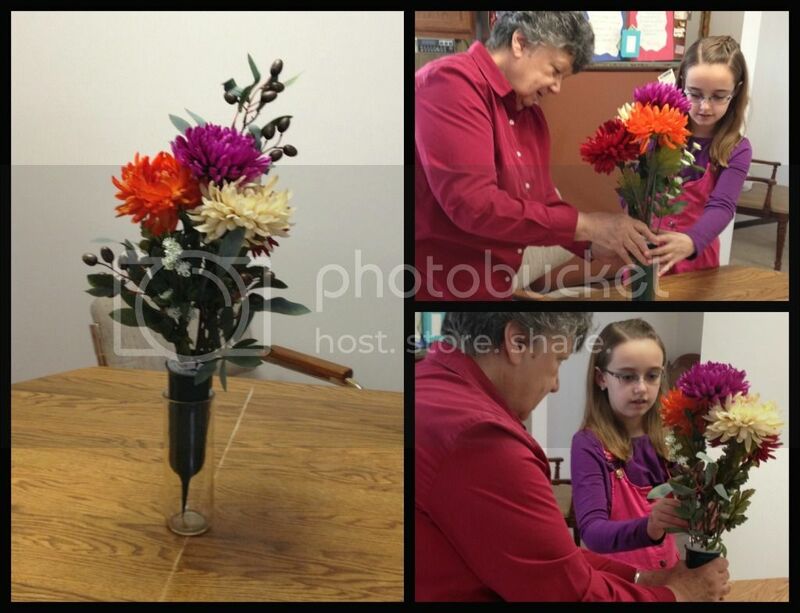 Instead, Mom and Amber created a silk flower bouquet for my dad's grave while I watched. The next day would have been my parents' 44th anniversary and we already had plans to take Mom to visit the grave. It was the first time that Amber or I had been back since the funeral. It was an emotional day, but went better than I thought. Fred, Amber and I also made our annual trip to the corn maze. Even though we live in a highly suburban area, there are still reminders of the way this area used to be. 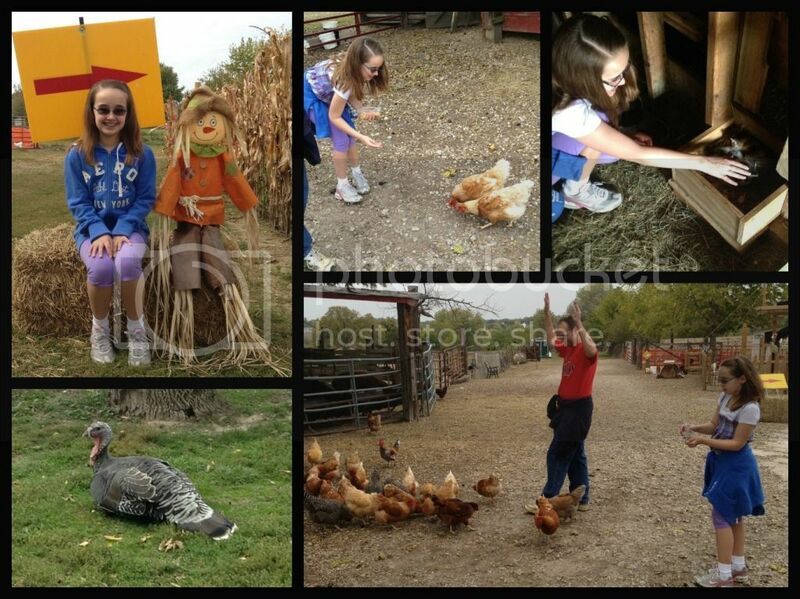 1.2 miles from our house is a working farm with cows, chickens, goats, horses and other assorted animals. Every year they also have a good sized corn maze in one of their fields. Due to crop rotation, the field changes and this year it was the back field. Not my favorite, but it was a good maze this year despite the location. We purchased a couple of feed bags to feed the free range chickens that follow all the visitors. Amber had fun feeding them at first. Then a whole group of chickens realized what she was about and rushed her. It was entertaining to watch. I got only a couple of good pictures because I was laughing too hard at the whole situation. (Top-L)Traditional corn maze entrance picture. (Top-R) In the chicken house, petting the litter of kittens. (Bottom-L) Turkey, just hanging around the parking area. I think his time is about up. (Bottom-R) Fred and Amber dealing with the chicken swarm. He's showing them that he has no food and Amber is backing up,desperately trying to finish her food off. There are more chickens in the group than would fit in the frame. Amber has been more relaxed the last couple of weeks, and enjoying the the change of season. I'm so thrilled to see her being the child that we remembered from years ago, instead of the stressed out person she became. 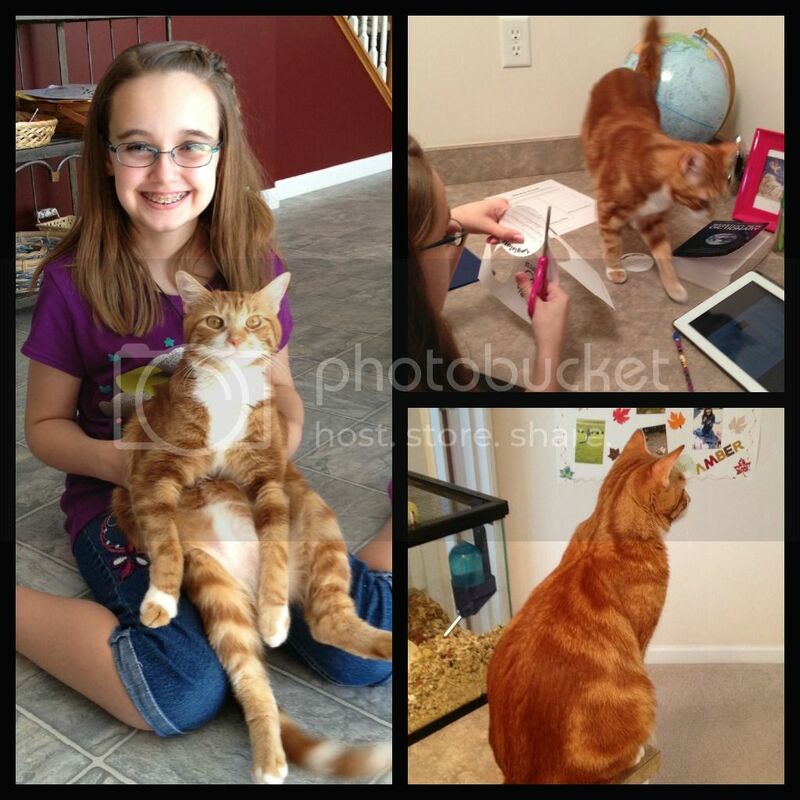 Her therapist has mentioned several times that homeschool really is working for Amber and that it is one of the best things we could have done for her at this time. It helps to hear other people voice these feelings, even though I already knew it was true. 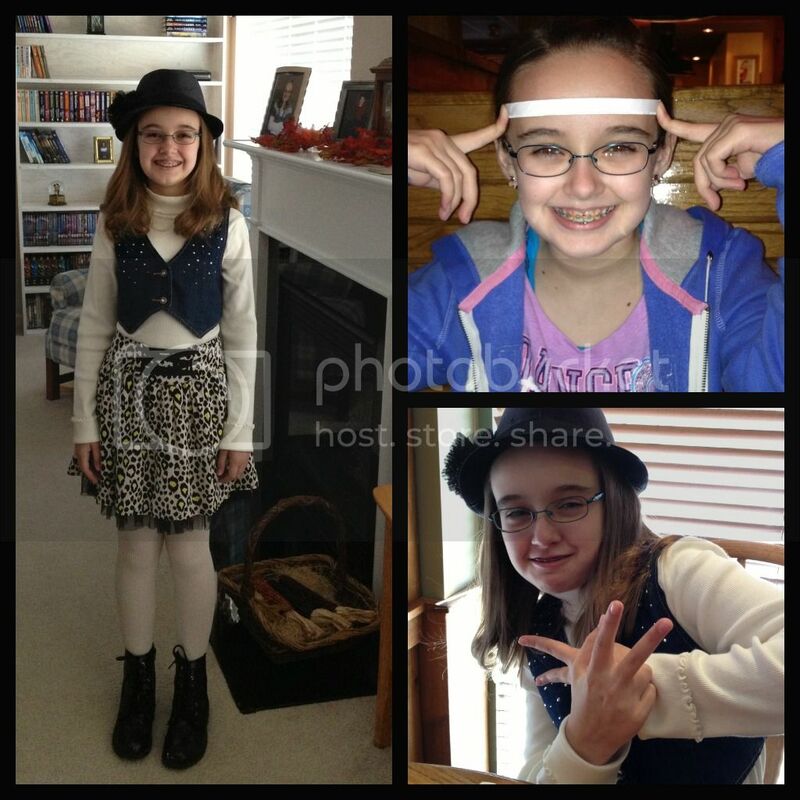 Amber dressed for church in a "cool" outfit she put together. Being silly at Outback before dance class. It is a straw wrapper headband. Lunch after church - "Peace out, word!" The things she learns from the dance girls that take hip-hop dance. Amber is not a hip-hop'er. The weather has finally turned cooler here, and we have plans to enjoy the Fall weather this weekend. I hope you all have a great weekend too. what about doing some nature studies and notebooking pages with her Life Science? Some parts of Life Science would go hand-in-hand with nature! Awesome that she is less stressed now! Yep, the first one is now the iphone cover. Both Amber and the cat look very different now than in the previous phone photo. Thanks for the nature study idea. I am looking at several curriculum for life science that are less structured and more... something. It's hard to say interesting when neither of us are fond of life science. We should to meld it with nature studies, if we can find nature to study. We live in a manicured yard type of subdivision. Our yard is such a let down to the neighbors. LOL. You would know all about the chickens. It was a hoot to see Amber and Fred with the chicken swarm. At first Amber was throwing the feed at her own feet. She wasn't too fond of those results. LOL! By the end she was tossing it as far away from herself as she could. Thanks Keri! I actually even multitask my down time. I'm right this minute working out and reading email, blogs and attempting to write a post. The post write is awkward on the iPad. Best I can hope for is semi coherent comments and significant calorie burn. Love to read about your weeks. I always love reading about a family with only one child like us. :) Amber is just so cute! I love the way she puts together clothes. Reminds me of Keilee. I like the cat pictures too. Keilee wants a cat but a dog is about all I can handle right now. I agree with the Science experiments. Keilee knows 90% of the time what the outcome will be. I wonder why they do that? They need some 'harder' experiments. Kei loves experiments but like Amber thinks some are a little lame. Christy thank you so much for the comments at my blog. They meant SO much to me.